There are 7 new Grocery offers from SavingStar available from today. 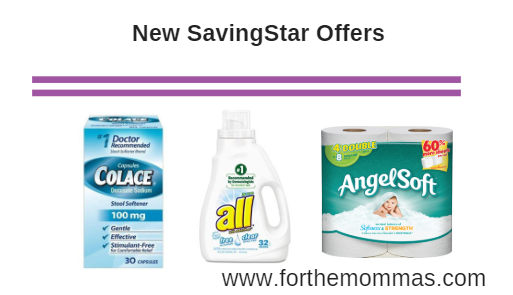 You can save up to $10.00 on Colace, Angel Soft, Sparkle, Brawny and more with the newest SavingStar offers. Save $2.00 on ONE (1) Colace® Regular Stregth, any size..Expires 9/30/2018.Save $2.00. Save $1.00 on any ONE (1) all® product. (Excludes trial size. ).Expires 8/19/2018.Save $1.00. Save 50¢ on any ONE (1) Snuggle® product. (Excludes trial size. ).Expires 8/19/2018.Save $0.50.